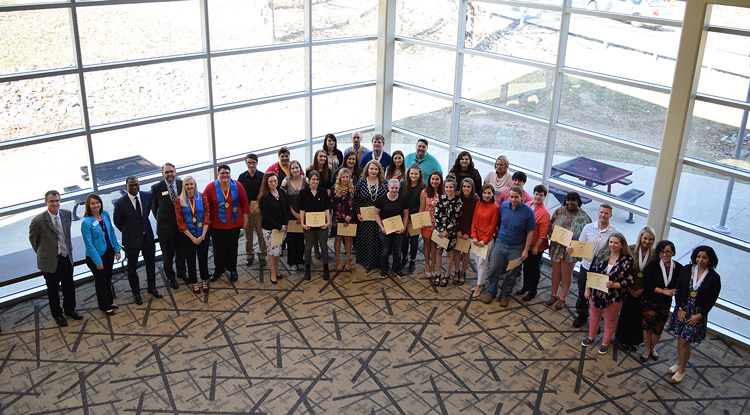 Hot Springs, Arkansas – National Park College (NPC) Alpha Beta Psi Chapter of Phi Theta Kappa inducted 37 new members March 13. Students must maintain a 3.5 GPA to be invited to the honor society. New inductees include: Shannon Allen, Justin Barthel, Christa Barton, Amanda Bearden, Holly Blankenship, Matthew Blocksom, Ashley Brown, Leslie Camacho, Jeanne Carmack, Alex Clark, Laikin Davis, Tyler Draper, Sara Furgerson, Abbey George, Ioana Georgescu, Amanda Gorecke, Kendall Greer, Alesha Harrison, Hayley Hawley, Amy Herndon, Garrett Humphrey, Devon Katayama, Crystal Lambert, Austin Long, Johnathan Long, Lacey Malliard, Katherine McCorkle, Taylor Meeks, Paige Morphew, Cory Morris, Desmond Pinson, Joseph Pultz, Jazzlan Rudd, Jillian Rudd, Terry Shelton, Megan Sliger, Lauren Solsby, Erin Tolleson, Christie Welch, Jaime White, and Hope Windle.